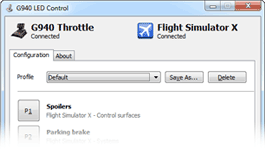 A must-have tool if you own a Logitech G940 Flight System and enjoy Flight Simulator X or Prepar3D. G940 LED Control links the state of your aircraft in Flight Simulator to the LEDs on your Logitech G940 throttle. By simply looking at the corresponding buttons you can tell if your engines are running fine, your gear is up or if you forgot to take off the parking brake. A translation of the Lua 5.2 C API for Delphi XE2 or higher, including wrapper classes for easy embedding. Requires Lua52.dll from LuaBinaries. Various bits of open-source projects, mostly Delphi libraries I've written over the years, are available on the public Gitlab.